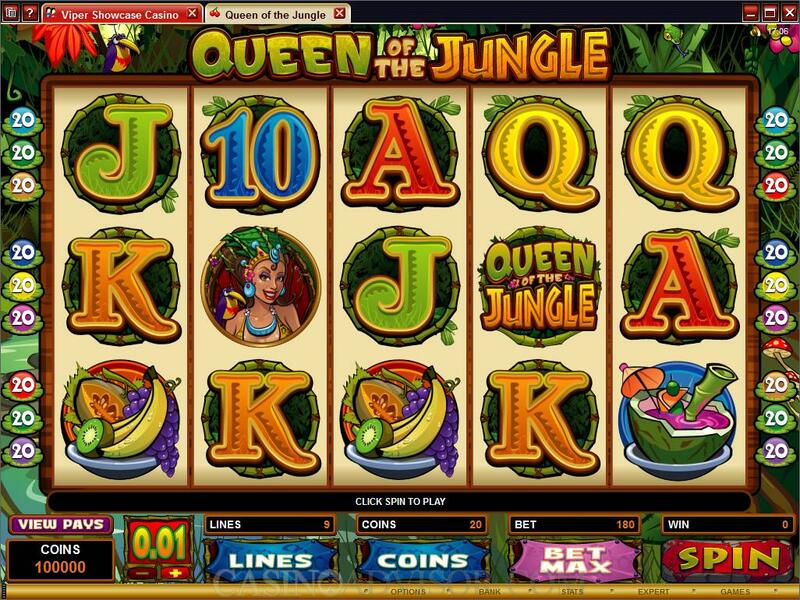 Queen of the Jungle is an African Jungle themed slot game. The Queen of the jungle is a symbol on the reels decked in tribal finery. There is a Tarzan like Hunk obviously in love with her holding out a flower to her. Another symbol is a platter of Fruits. The slot game has two scatter symbols - three Monkeys and Passion Fruit. The wild symbol is the Queen of the Jungle Logo. All these symbols are crafted in caricature style but show great detail and are in bright colors. High value card symbols from Ace to Nine are also symbols on the reels. These are also in bright colors and bear tribal motifs. They are set against green leaves and blend in with the theme. 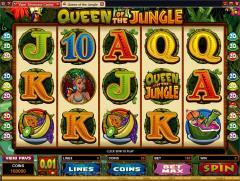 Queen of the Jungle is a 9 payline video slot from Microgaming. This is low as compared to contemporary slots but is made up in the other betting options. The number of coins per payline can be as high as 20 and the coin sizes vary from 0.01 to 0.50. Because of this the maximum line bet is 10.00 and the maximum total bet per spin is 90.00. The Queen of the Jungle Logo is the wild symbol. It substitutes for all symbols except the two scatter symbols. It offers line payouts but does not act as a multiplier. Each of two scatter symbols offers scatter payouts when two or more of each appear anywhere on the reels. When three or more Passion Juice symbols appear the Free Spins Feature is triggered. This feature awards 15 free spins at tripled payouts. The free spins can be retriggered. The bonus game on the second screen is more exciting. It is triggered when three or more Monkeys symbols appear on the reels. 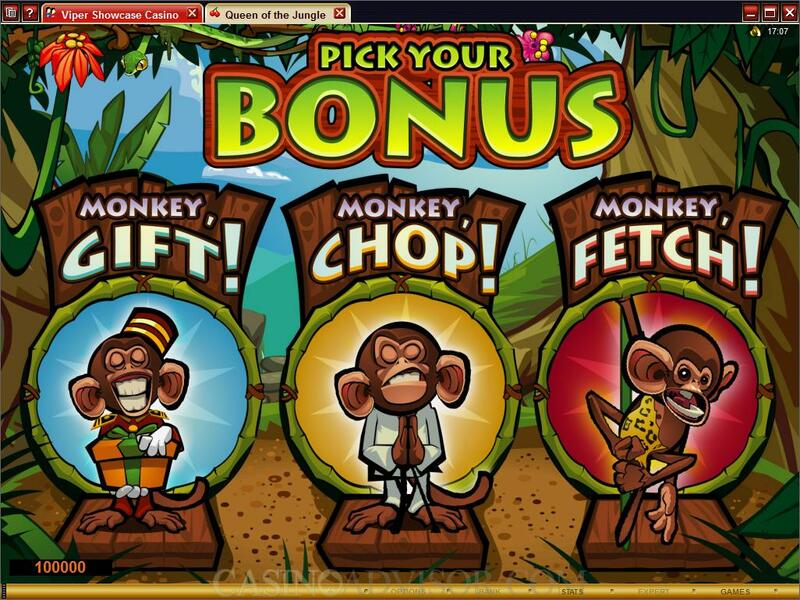 Each of the monkeys has a different bonus game to offer and the player has to choose one of them. The Monkey Fetch bonus has 10 monkeys hanging from vines. Players have to select three of them. 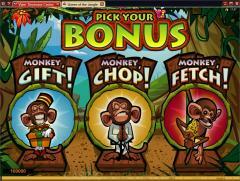 Each time the player selects a monkey he clambers up to the tree and returns with a fruit and bonus credits to match. The Monkey Chop bonus has the Queen sitting on her throne and 12 coconuts lined up on the floor. The player keeps on selecting coconuts till the monkey is unable to break open the selected coconut. When the coconut is selected the monkey dressed in karate clothes appears and chops the coconut open with his palm. If he succeeds the player gets bonus credits. If he fails the player gets a compensatory bonus and the game is over. In the Monkey Gift bonus the player chooses from 9 gifts and is given three chances to change his mind if he feels that the gift is not awarding sufficient bonus points. Interested in reading more detailed information about Queen of the Jungle? If so Click Here for more details.